Earl McKee, the Singing Cowboy with the High Sierra Jazz Band, has been dealing with some serious health issues that have required major medical expenses. His friends in the jazz community who have enjoyed his sousaphone, mellow vocals and great stories have set up an on-line fundraising campaign (www.gofundme/friends-of-big-earl) to raise $20,000 to assist in covering medical bills and prescriptions that Earl’s insurance does not. 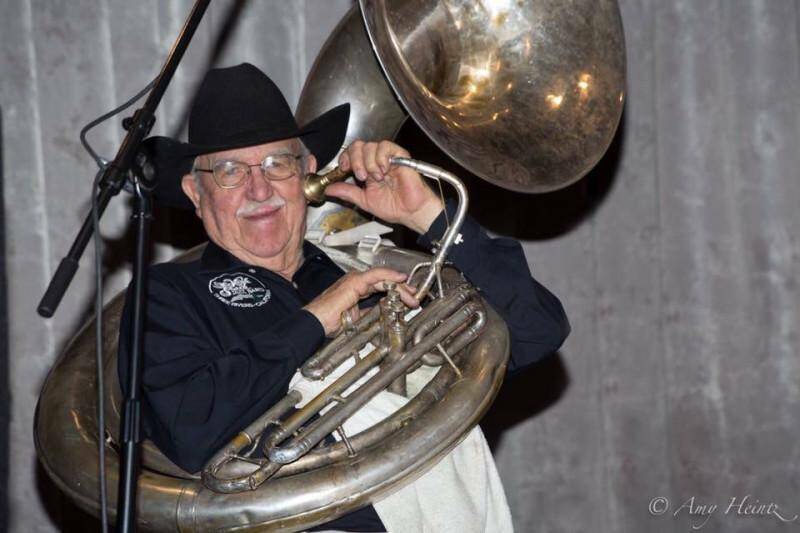 One of the original members of the High Sierra Jazz Band dating back to 1976, Earl McKee is a livestock rancher who raises cattle and quarter horses on the family mountain range and home site in Three Rivers, California. His signature cowboy hat is not just a fad, but a standard part of his daily wear. Earl can play several stringed instruments such as bass, guitar and violin, as well as the big bore brass horns. He is a stickler for the correct “bottom line” notes, and as a result, plays all the right changes, contributing significantly to that “High Sierra sound.” Earl’s singing voice, which has such a wide range that it could be described as either baritone or tenor, is unequalled in any jazz band. So let’s pitch in and get Big Earl back in the saddle and back on the bandstand.